Nature shows us the very best of the struggle for life as a very small bear cub tries to follow its mother up a snowy sope. This youngster has guts and perseverance. It struggles agains the laws of physics about which it knows nothing. Mama bear stands helplessly by as the cub struggles to reach her. NOTE – There is no accompanying sound with this video. Just sit back and watch! I was almost snow-go for a cute – and determined – cub which gamely tried to follow its mum up a steep and extremely slippery snow-covered slope. Video footage of the plucky young animal shows the creature refusing to have a melt-down, despite repeatedly sliding down the powdery surface. The clip, which has gone viral on social media, had viewers admitting they felt “stressed out” as it was “hard to watch” the cub continually slide down the mountain, towards rocks. It starts by showing the pair clambering over a rocky patch of ground as the mum guides her young cub towards the top of the mountain. Both animals initially slide down the slope, but the mother quickly regains her footing and makes it to the ridge, where she waits for the cub to join her. Plenty of heart-stopping moments follow as the cub struggles to reach her, and it leaves long trails in the snow where its claws have dug in to stop it slipping too far below. However it slides a considerable distance, ending up on a large rocky patch. Meanwhile, its mother looks anxiously over the ridge, pacing to and fro. At one stage, the cub is within just a few feet of its mum. But at this precise moment, when the cub is nearly beside her, she appears to look straight ahead, and seems nervous about a drone filming her cub. Video-Ohs: Lion, Tiger and Bear – Really! This is a sad, but heartwarming story of three animals that were found in the basement of a drug dealer when the house was raided. The very young animals (lion, tiger and bear) were mistreated and injured. They apparently bonded when they were kept in the basement during this time as they were they only other living creatures to show warmth and kindness. Once freed, they were brought to a sanctuary where they continue to live as BFFs. The video is interesting and remarkable as these three predators have found a way to get along and survive. Once kept as illegal pets, bear Baloo, tiger Shere Khan, and lion Leo share a brotherly bond despite how unbelievable it might seem. The trio cuddles and plays in their new home in Atlanta, Georgia. Followers of JBRish know that I enjoy photography. It is a hobby that allows people to express themselves and exercise their imagination. One of my favorite subjects is wildlife which usually consists of birds, rodents, small animals, etc. Yesterday he tweeted a picture that I thought was indicative of the problems, unforeseen circumstances, etc. of a wildlife photographer. 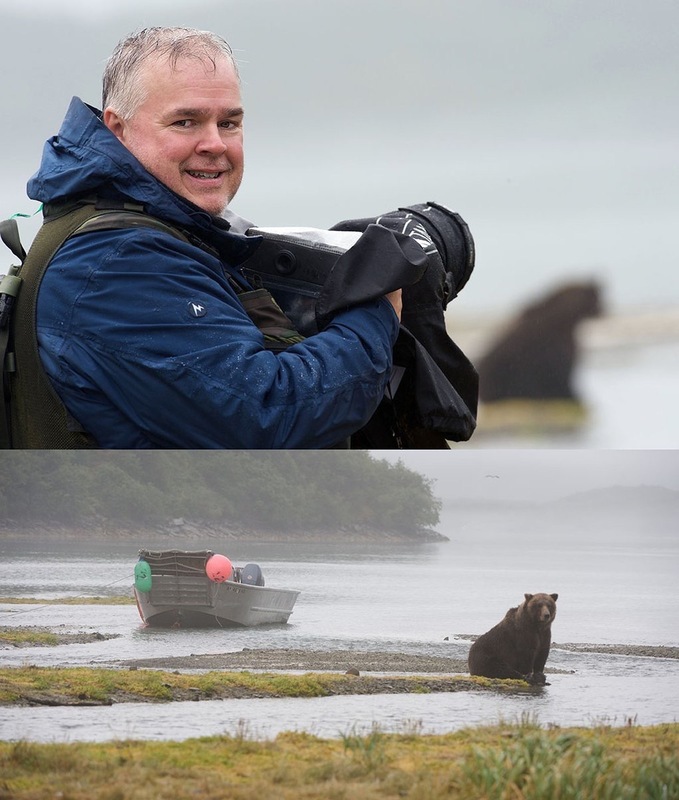 The composite shows Scott with his camera and a thousand pound bear standing in the way of his exit via boat. As I learned recently while filming a group of Elk, when dealing with living subjects, a photographer must be ever vigilant, expect the unexpected and react wisely.